The discussion today around parenting often centers on "helicopter parents," those parents who hover over every aspect of their children's lives to such an extent that they organize and monitor every minute of their children's lives. As a result, their children have little or no space to explore the world on their own and learn how to effectively navigate life's challenges from one of life's great teachers -- learning from failure. The fact is that no matter how closely parents try to manage their children's lives they can't possibly protect them from life's trials and tribulations. Indeed, parents shouldn't protect their children from those things. Parents should guide their children instead in how to effectively manage the challenges they'll face on their own. Even then children need the resilience to bounce back from those challenges because, inevitably, they will fail. They will make mistakes. They will get knocked down and, in some cases, knocked out. Although counterintuitive, the sooner parents live with and embrace that their children will fail, the more effective parents become. Active Optimism: Resilient people are optimistic even in the face of challenges and setbacks. They're not overly optimistic, but realistic in their optimism that when they continue to move forward and avoid paralysis in making decisions, they will eventually succeed. Decisive Action: Resilient people act on their optimism. They consider their options, decide how to face challenges and act decisively. They don't allow challenges to paralyze them or wait for others to tell them what to do. They don't wait for things to happen, they make things happen. Moral Compass: Resilient people have a moral compass anchored in honor, integrity, fidelity and ethics. They use this anchor to decide which actions to take. Relentless Tenacity and Determination: Resilient people stay true to the paths on which their decisions take them. They don't quit. Not quitting doesn't mean they are so naive or stubborn that they're unwilling to change a path when it becomes clear that a decision was not the best one. It means they won't quit until they find out whether their decisions are the right ones and, if not, to pursue other solutions. It also means that when it's clear they've failed, they won't allow failures to keep them down or negatively affect their self-worth. Interpersonal Support: Resilient people realize and embrace the need for help. As they make decisions, they consider whether they can go it alone or need help. When they ask for help, they don't feel in the least that help is a sign they are somehow inadequate. I would also add a sixth factor: resilient people lack a victim mentality. There are legitimate situations in which people are victims, a perfect example of which is the recent murders of more than 125 people in France from multiple, coordinated acts of terrorism. But a victim mentality is a state of mind, a trait that someone acquires and leads to blaming external factors (e.g. people) for failures even when no clear evidence exists that external factors played a role. The lack of a victim mentality doesn't mean that someone is never a victim. It means resilient people don't seek to blame someone or something else or for their failures -- even when someone or something else might have contributed to a failure. They accept responsibility for their part and the lack of control they have over external contributing factors. They get up and move on. A great perspective to take in raising your child to become resilient is the second of The 7 Habits of Highly Effective People: Begin with the End in Mind. (These habits apply to being an effective parent as well.) Who do you want your child to become when she or he is an adult? 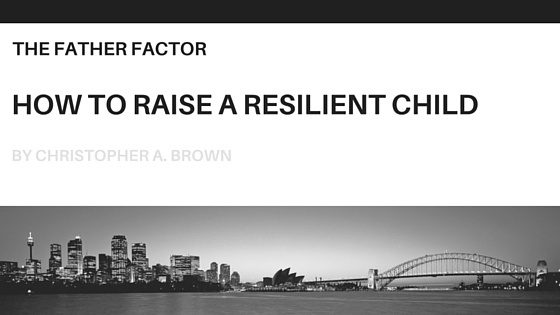 If you want your child to be a resilient adult -- and to raise your grandchildren to be resilient -- focus on building these six factors.